Wear loose fitting, comfortable clothing, and proper shoes that offer safety and support. As you know, practising exercises is very important to keep muscles working the right way and maintain your flexibility. Here, we have collected the list of the best Senior Char Exercises you can do. This exercises list works perfect for beginners, intermediate or advanced senior willing to work almost all part of the body. The list is classified by the body’s part targeted by the chair exercises. So Let’s Start. It is very important to warm up before any exercises to avoid incident and prepare muscles for the exercises. This list is originally published on vivahealth(2). If you are looking for a full workout program for Chair Exercises, you may need a coach or instructions to follow in order to make the workout as optimum as possible. This will help you do the chair exercises the right way. Senior chair Exercises DVDs can be good alternative and very affordable if you are serious to start practising some workout. Here our Top 5 pick for Senior Chair Workout DVDs for beginners, intermediate and even advanced. Sit and Be Fit is a non-profit organization that produces America’s award winning television exercise series, Sit and Be Fit. Each chair exercise program is carefully researched and designed by host Mary Ann Wilson, RN and a team of physical therapists, doctors, and exercise specialists. 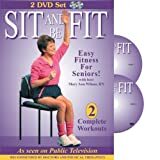 Sit and Be Fit has been broadcast since 1987 on PBS stations to over 86 million U.S. households annually, and is recognized by the National Council on Aging (NCOA) as a “Best Practice” program in health promotion and aging. The Stronger Seniors Stretch & Strength Workout Program is designed by Certified Fitness Instructor Anne Pringle Burnell to help seniors develop strength and to enhance the ability to function in daily life. These two fitness DVDs work together to improve your ability to be stable and balanced, to stay mobile, to go up and down stairs, to squat and pick something up, and to play with your grandchildren! Exercise at home regularly with the Stronger Seniors Stretch & Strength Program to increase flexibility, gain strength, and improve heart health and balance. The Stronger Seniors Stretch and Strength Chair Exercise DVDs are: designed specifically for seniors and the elderly, are performed in a slow, relaxing pace; and are safe, simple and effective. This set contains two DVDs containing two complete programs. The Stronger Seniors Core Fitness Chair Exercise Program is designed to help seniors and the mobility-challenged develop strength and flexibility, enhancing the ability to function in daily life. Core Fitness is specially designed to strengthen your abdominals, lower back and pelvic floor muscles: those which support your spine and internal organs – the foundation of your body. Exercising the core is essential to good posture and balance. If you are looking to better your overall health, Stronger Seniors Core Fitness Chair Exercise Program is an effective, well-paced exercise DVD. Fu Style Healing Exercise: The Power to Heal Yourself – A Revolutionary Sitting Tai Chi Video by Tommy Kirchhoff is now available! At Home Chair Exercises for Seniors & Older Adults Revolutionized. Tommy has created an easy to follow, incredibly powerful at home exercise DVD for you that mixes the benefits & gentleness of an at home chair exercise with the incredibly meditative & healing techniques of Tai Chi. Core Strength is a chair-based Pilates program that will transform your body from the inside out. This gentle program uses a resistance band to build strength and flexibility in the upper and lower body. The Stronger Seniors® Core Fitness Chair Exercise Program is designed by Stott Pilates Instructor Trainer and Faculty Provider Anne Pringle Burnell to help seniors develop the core foundation of the Body. The muscles of the Abdominals, the Lower Back, and the Pelvic Floor support the spine and internal organs, essential to the overall fitness of the body. This 10 minute chair workout for seniors is a perfect way to gain strength and be healthy. HASfit’s seated exercise for seniors and chair exercises for the elderly requires no equipment. As we age, physical activity helps us attain our goals, maintain our functioning and promote comfort. In addition, routine exercise can help reduce arthritis pain, improve mood, sleep and blood sugar control, as well as affect memory. This video includes both balance and strengthening exercises, which can prevent falls and hip fractures. This video is appropriate for those older adults who cannot stand or who need support when standing. A Healthy Life Chair Exercise with Eliza Lynn. Produced by Buncombe County Government Television.